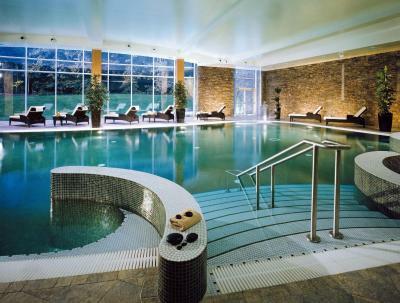 Lock in a great price for Fota Island Hotel and Spa – rated 8.9 by recent guests! Very relaxed environment, with gorgeous surroundings, both in terms of the hotel fixtures and the outside walking trails. Staff are extremely friendly & attentive. The location and access were easy to get to from the main motorway. The staff and check in was excellent and customer service questions were all catered for. The room was spacious and comfortable and very clean. Staff were friendly and courteous. The room was perfect with a gorgeous walk in shower. The bed was very comfortable and the tv was nicely sized. The spa was clean and staff there very accommodating. Highly recommend staying at this place. The bedroom and the bathroom was perfect, absolutely immaculate, room temp was perfect. Really enjoyed our stay in our room! Room was freshly cleaned on the second day of our stay, which we appreciated. Facilities were brilliant! Service overall was good. On the whole, Enjoyed my stay. 10/10 for food in the Amber Lounge (dinner + lunch) and in the Restaurant (dinner) Best, most relaxing, most delicious hotel stay I have had, probably ever! Staff were also polite and helpful with everything every day. Thank You! Great property. Amazing grounds. Room with balcony was great. Early check in, friendliness, incredible room Spa & golf course perfect. Breakfast off menu & at stations Incredible. Fota Island Hotel and Spa This rating is a reflection of how the property compares to the industry standard when it comes to price, facilities and services available. It's based on a self-evaluation by the property. Use this rating to help choose your stay! Bedrooms at Fota Island feature flat-screen satellite TVs, free Wi-Fi and an interactive video system. They also include mini-bars, seating areas and bathrooms with walk-in showers and bathrobes. Huge windows allow light to flood into the spacious and stylish Fota Restaurant. It serves fine traditional and international cuisine and has a terrace for open-air dining. Guests can also enjoy afternoon tea or a cocktail in the relaxing Amber Lounge or The Spike Bar. The hotel boasts 18 treatment rooms where guests can enjoy massages, hydrotherapy and thermal suites. Guests can work out in the state-of-the-art gym. Ireland’s large wildlife park, Fota Wildlife Park is a 5-minute walk away. Cork Airport is a 20-minute drive from the hotel. 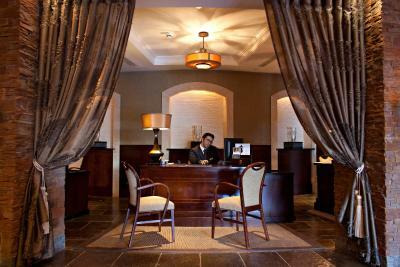 When would you like to stay at Fota Island Hotel and Spa? This comfortable room features a flat-screen satellite TV, free Wi-Fi and an interactive video system. It includes a minibar, sitting area and private bathroom with walk-in showers and bathrobes. This twin/double room has a view, satellite TV and seating area. House Rules Fota Island Hotel and Spa takes special requests – add in the next step! Fota Island Hotel and Spa accepts these cards and reserves the right to temporarily hold an amount prior to arrival. The hotel is wheelchair accessible and provides reserved parking spaces at the front of the hotel. Carpets and curtains in the suite a little grubby. Not a great selection for breakfast and tea very weak. Staff in spa uninterested and unfriendly. We stayed during the week and there were a lot of excited children up and about early running the halls so don't expect a lie in or a quiet breakfast but most people will expect this due to the Wildlife park. The cooked breakfast wasn't very flavorsome but there was a great selection of other foods including a cook your own pancake machine and the staff could not have been more accommodating. The staff were very friendly and check in was hassle free. Had room service as our meal in the evening which was restaurant quality. Room equipped with movies for a little extra. Pool area was gorgeous with a beautiful jacuzzi. Very remote but perfect for escaping. The staff were so good, on reception, at breakfast, and dinner, in the spa, at the pool and anyone you met in the halls. The room was gorgeous and the spa was simply heavenly. Could not have asked for a better stay. Excellent hotel.Staff excellent Facilities excellent Golf clubhouse food good. Staff were very friendly, bathrooms were very spacious & clean. Nothing major but bar closed without a final call. We were told there was no residence bar, to be fair the barman on did give us a last drink. Very clean, staff friendly and helpful. Very peaceful and quite. I've been here the last 4 years and intend to go again. We didn't find any faults. Staff were very helpful and friendly. Dinner and breakfast were great.